Hello Linux Geeksters. 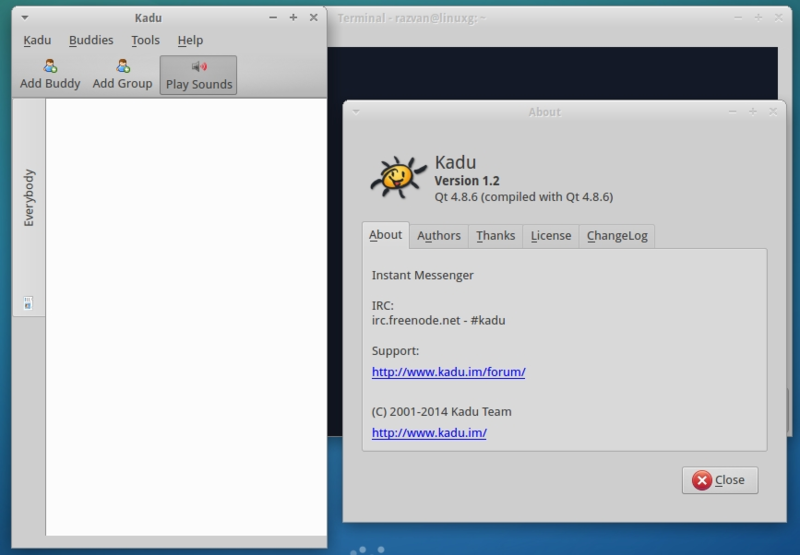 As you may know, Kadu is an open-source instant messenger client written in Qt, having support for popular messaging protocols, like: GaduGadu, XMPP, GTalk, Facebook Messenger. The latest version available is Kadu 1.2, which has been released a while ago, coming with a bunch of changes and fixes only. In this article I will show you how to install Kadu 1.2 on Ubuntu 14.10 Utopic Unicorn, Ubuntu 14.04 Trusty Tahr, Linux Mint 17.1 Rebecca, Linux Mint 17 Qiana, Pinguy OS 14.04, Peppermint Five, LXLE 14.04, Elementary OS 0.3 Freya, Linux Lite 2.0, Deepin 2014 and other Ubuntu 14.04 derivative systems.